Hello friends! 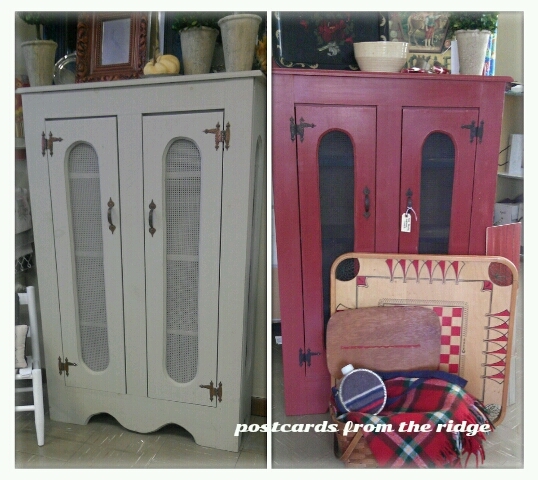 I've been busy the last few weeks painting some furniture pieces and adding some accessories to my corner of the shop. Just thought I'd say hello and show you what's new. Let me know if there's something you're interested in purchasing, or if you'd like a quote for a custom paint job. I'm having fun transforming pieces with paint, wax, and new hardware. 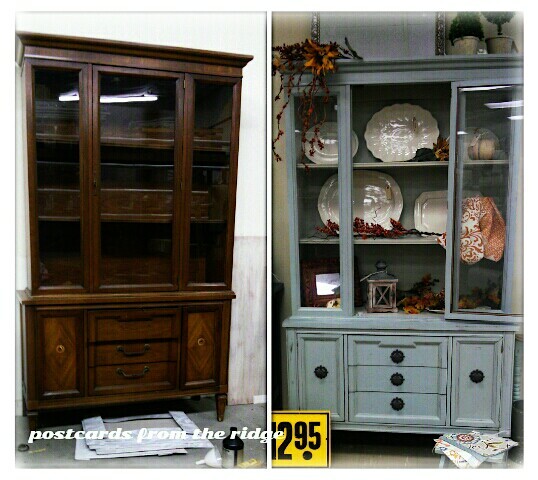 I transformed this vintage china hutch by painting, distressing, waxing and changing out the hardware. I must admit, I don't mind terribly if it doesn't sell because I'd love to take it home! A sweet pie safe, went from drab gray green to a cozy red with black accents (SOLD). Perfect for extra storage in the kitchen or even the garage. 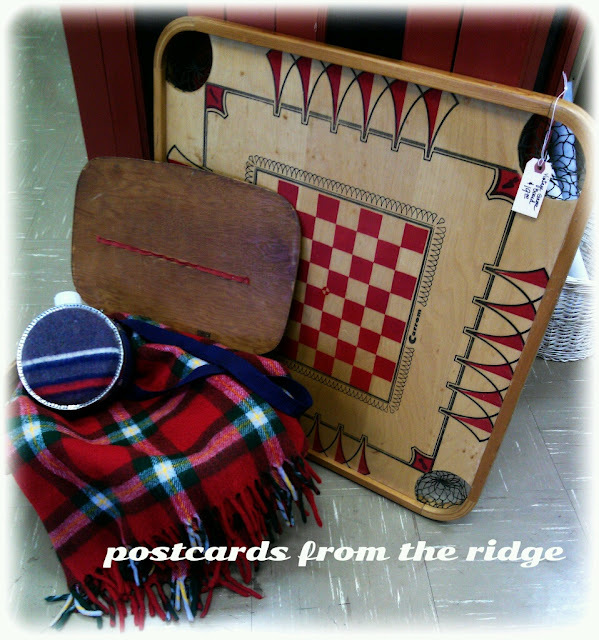 The game board (SOLD), vintage canteen, vintage picnic basket and vintage throw are all for sale as well. 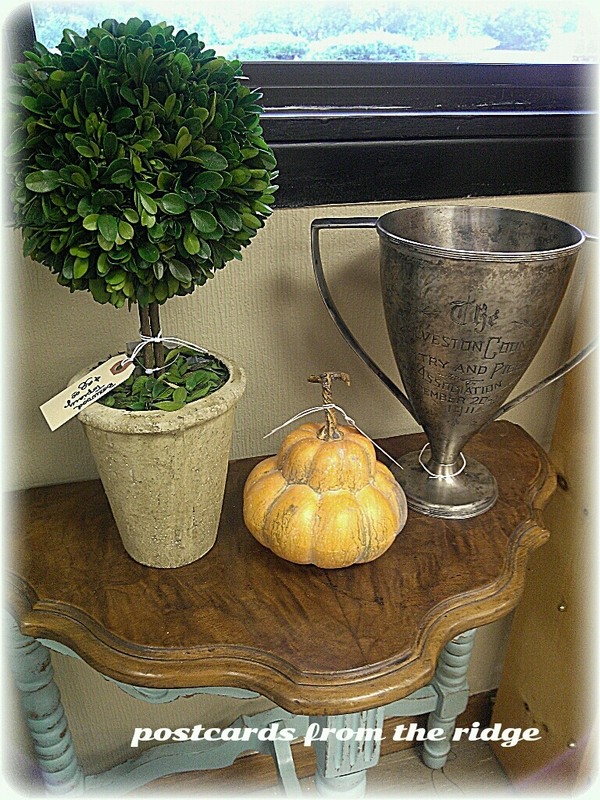 The accent table, preserved boxwood topiary and faux pumpkin are for sale, but the trophy has already sold! These topiaries are $38, which is about 40% less than the ones I've seen in designer catalogs. Three shapes are available. 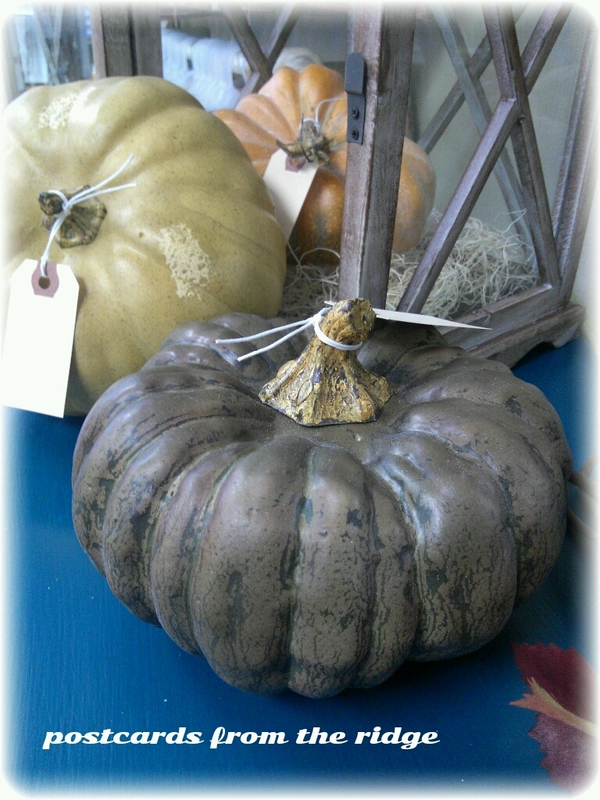 These faux pumpkins are very realistic and last forever. There are 6 different ones, ranging in price from $8 to $12. How about a picnic and a vintage game board? I saw these boards in a designer catalog recently for much, much more than my price of $19. Need some serving pieces for the upcoming holidays? 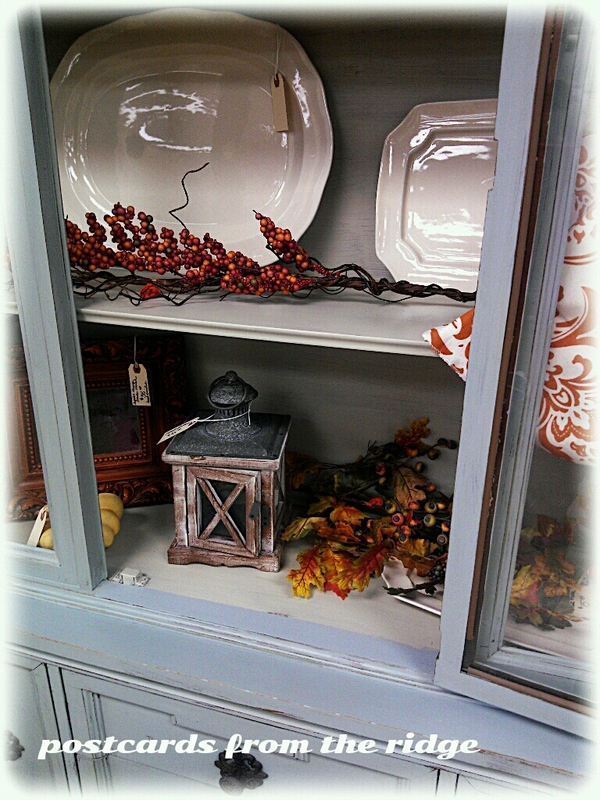 These creamware pieces are perfect and coordinate with everything. The largest piece, which would be great as a turkey platter, is $20. The smallest one is $12. Medium sizes are $16 and $18. Painted, distressed and waxed, these mirrors, step stool and dry erase board (in green) would be a fun addition to any space. 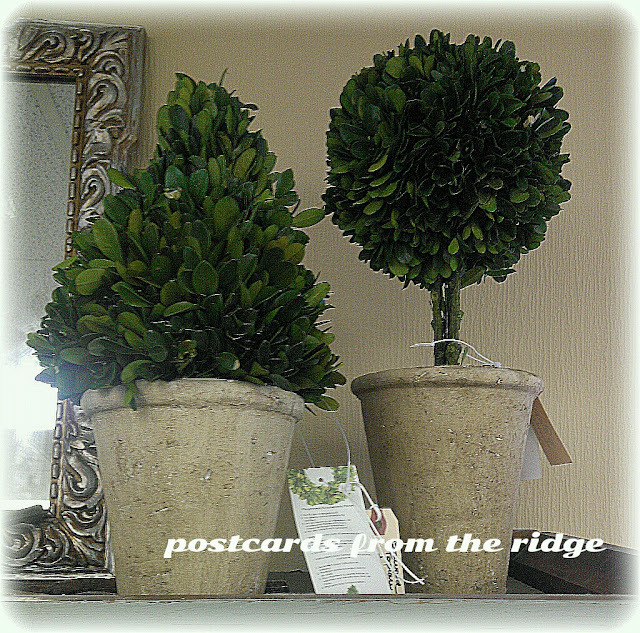 Another picture of the preserved boxwood topiaries. This is a piece that I'm currently working on. It's an oak bathroom wall cabinet that's getting a gray wash, and probably some new hardware. I'll post a picture when I'm finished with it. 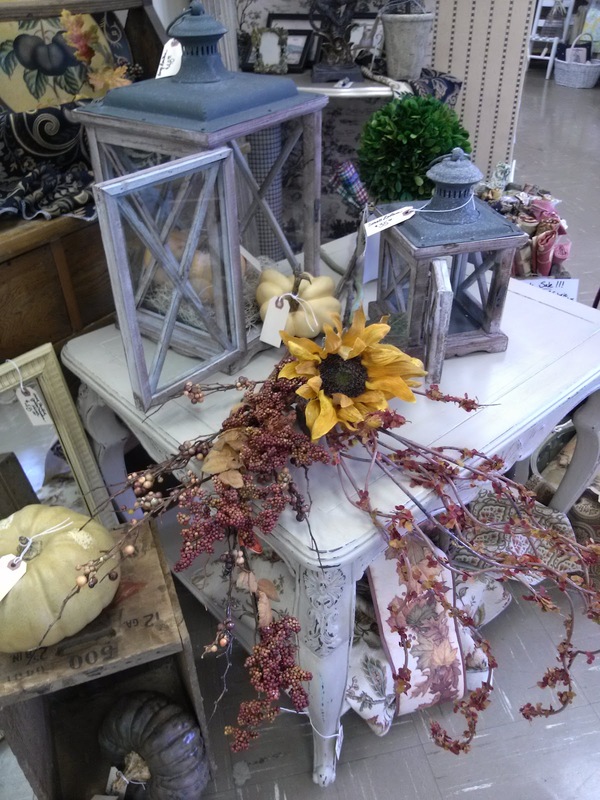 This accent table for $85 is a nice neutral shade and would complement any color. And the wooden lanterns would be great on a fireplace hearth or front porch. $35 for the smaller one, $48 for the larger. I love the lines on this curvy dresser. 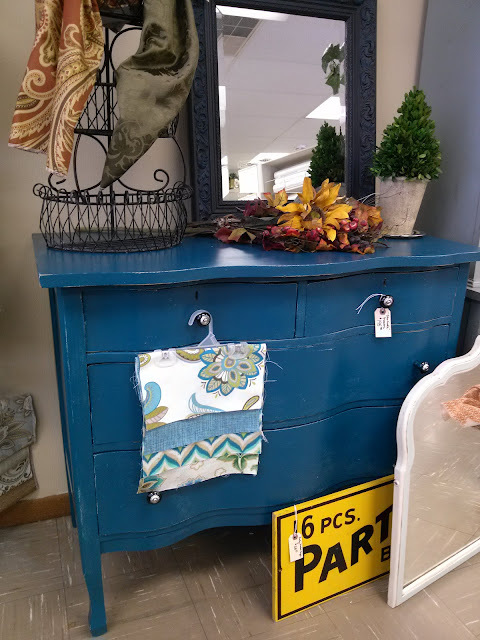 Painted in a rich turquoise hue, it has knobs that are turquoise glass and silver. It has been distressed and waxed. Priced at $195. If you're curious about all the fabric swatches hanging and seen in the pictures, they are all stocked in the workroom that makes our pillows, valances, draperies, shower curtains, and just about anything you can dream up. They've added some really fun prints and colors to their extensive line this fall. All of them are also available by the yard. Prices start at around $15 per yard. So now you know what I've been up to lately. That, and also I've had several design consultations already this month. (Yay me!) October is always a busy month at the shop. Everyone always wants their house to look it's best for the holidays so there's lot of paint mixed and fabrics coordinated for people up until mid-November. And.... this weekend is the southern Bloggers Conference! I should have lots of fun and exciting things to report on. And I can't wait to meet some of my blogger friends face to face.﻿ Good times!! You do absolutely beautiful work. I would love for you to link this up to my Fall into Fall party that opens at 8pm EST tonight. Hope to see you then. 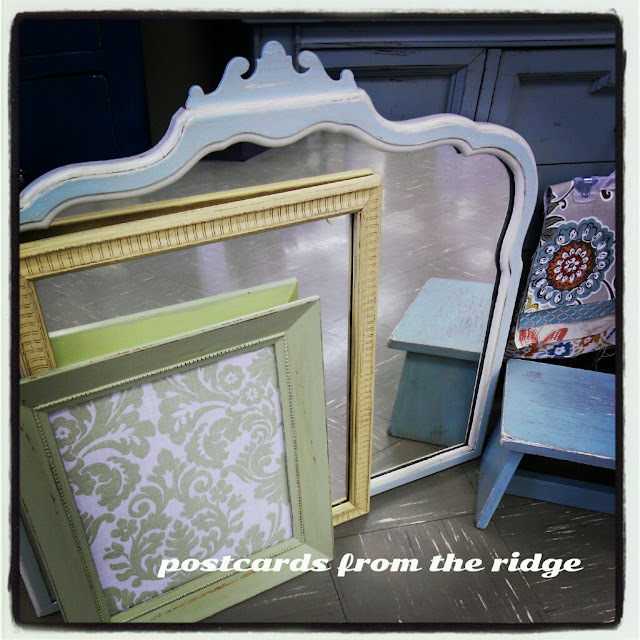 Your furniture transformations are beautiful! Wish I lived closer to shop with you. 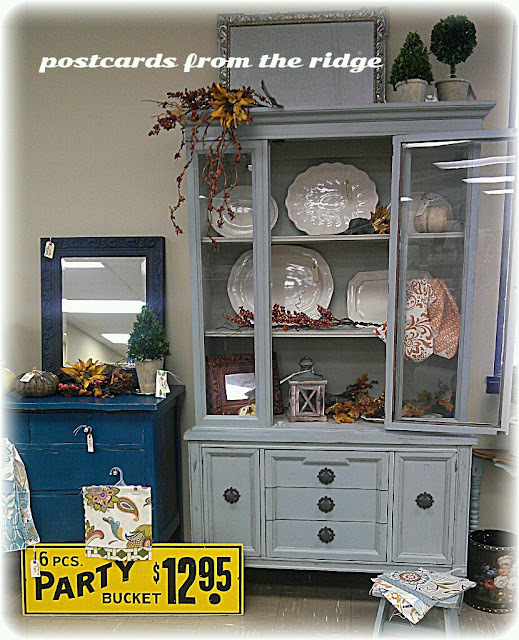 Gorgeous work Angie!Wow!The painted pieces are beautiful...and beautifully staged. Stopping by from Savvy Southern Style. You have some beautiful things. I am a new follower. All fabulous things Angie! You do some wonderful work. Thanx for sharing at THT! all the things you paint angie are very nice. I like especially pie safe,vintage china hutch and accent table. your collection was great.Thanks for shearing. 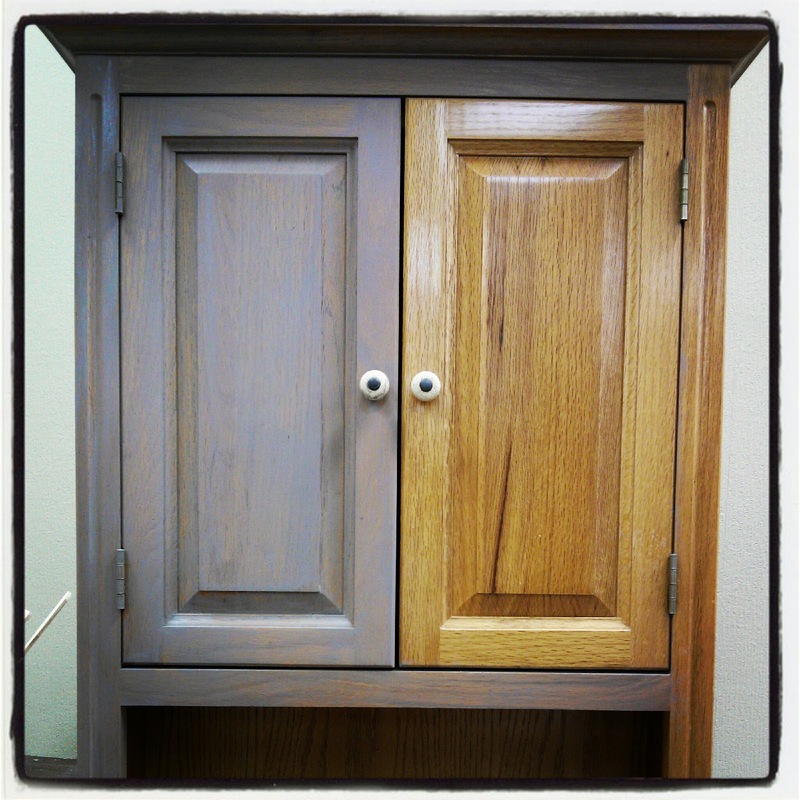 Hi- I had a question about the oak cabinet that you are grey-washing. Did you sand it prior? I have 1970s oak cabinets in my kitchen that I'm looking to color-wash (can't stand the oak color) but I don't really want to sand unless the color will not stick to the cabinets. Any pointers? Thank you- the cabinet looks great!